We aren’t known to be the biggest Versace supporters at our site, but we’ve been feeling a it warmer lately. I know some people absolutely love the brand, but Donatella’s accessories almost always go over the edge of overt opulence; they’re often too ornate for my liking. 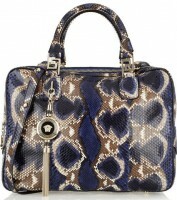 However, upon seeing the Versace Structured Snake-Effect Leather Tote I felt true excitement. Sure, the overall design is simple, but the python print along with the coloring screams “fall statement piece.” (It also sort of screams “Valentino Fall 2011,” but that’s another post entirely.) The sad news is that PurseBloggers, we have a problem: the price. 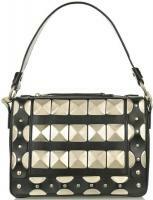 Versace Studded Leather Shoulder Bag: Love it or Loathe it? Every handbag lover out there has a different taste. While this means so many of us can be on complete opposite ends of the interest spectrum, it means that designers are pushed to create a plethora of designs for us. So, no matter what you like, we all win! Let’s be honest, there has not been much praise from the PurseBlog team given to Versace. And it is kind of sad, because Versace is one of the most well-known design Houses alive. Today I have found a Versace bag that still will not appeal to many, but has some aspects that are totally quirky but alluring for me. I’m ready for the comments saying otherwise (and hopefully some that agree with me). Oh my! Very rarely do I start of talking about the price of a handbag, but in this case, I have to. I cannot believe this handbag is over $4,000! I know, I know, it is Versace and perhaps I should be used to these kind of price tag, but still, c’mon now. Ok, let me talk about the handbag a bit. 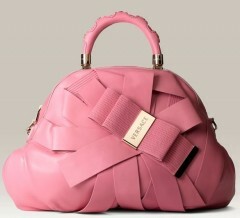 The Versace Venita Bow Satchel is a new piece from the spring 2009 line. Wide swaths of gorgeous pink leather topped with some trapunto stitching definitely work well together. 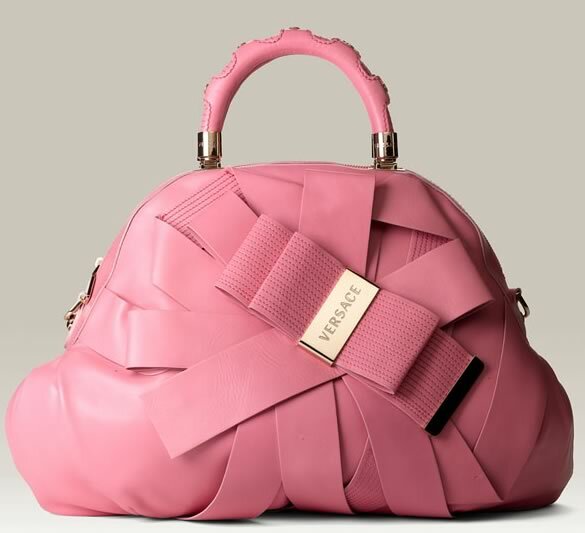 Now add a logo-topped bow and double handles and the entire bag comes together. 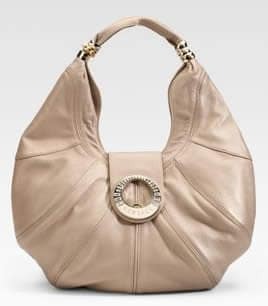 I like the overall soft, whimsical and feminine look of this handbag. This is definitely a handbag that you don’t see often. Although a quick glance might lead you to think the bag is a tad messy, I think it works. If I could talk to the folks over at Versace I would definitely be curious to know where the inspiration came from. What a fun and flirty handbag to sport this Spring, now if I could just collect all the pennies from all the couches across America I might be in luck. Pre-order through Nordstrom for $4395. Holy crackers, Versace has gone and made a bag that I like. Quite honestly, I thought I was pretty safe from the charms of Versace’s accessories line. It has always seemed like either way too much or not nearly enough for me. On the one hand, a lot of it is blinged, studded, quilted, rouched, and covered with hardware and fringe to the extent that I’m not sure if it would actually function as a handbag. On the other end of the spectrum, I’ve seen handbags of theirs so boring while still being so astronomically priced that they gave even me handbag ennui. The Versace Multi Ring Hobo (almost) gets it right, though. I don’t love the color, but it may come in others, and the leather looks like it would be obscenely soft and supple. The shape is nice and wearable, and I like the pleated effect of the construction. This bag’s tragic flaw, though, is the price – at over $3,000, I’m not sure that it’ll go to the top of many wishlists. Please, Donatella, rethink your accessories pricing – it might get you a much larger piece of the pie if you keep designing at least mildly attractive bags. Buy through Saks for $3145. Yep, I think I am in love. As soon as I saw this handbag I knew I wanted to share it will all of you. 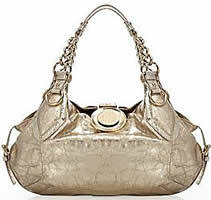 This gorgeous Versace Crinkled Metallic Leather Shoulder Bag needs to be added to my collection. I tend to think twice about shiny, metallic bags, but this one seems to be just my type. Versace is known for their impeccable attention to detail and gorgeous material. This bag does not fall short. And I don’t see the handbag going out of style anytime soon – it has timeless qualities. I think one of the things I like the most is the color; you can sport it every season. The combination of crinkled coated metallic leather and textured metallic leather trim adds a little something different. Although the color of the chunky link chain shoulder straps isn’t much different than the color of the bag, there is enough difference to notice a small contrast. As I mentioned earlier, Versace always pays attention to the details surrounding each bag. Here, they’ve added a gold ring and stud details throughout and the flap closure has buckle detailing and a weighted gold metal and acrylic Medusa medallion. I figure, if I am going to spend quite a bit of money on a bag, I expect the attention to detail to be apparent. If nothing else, that way it feels like you are getting enough bang for your buck, right? No matter what, this bag is without a doubt a winner. Buy through eLUXURY for $2,265..